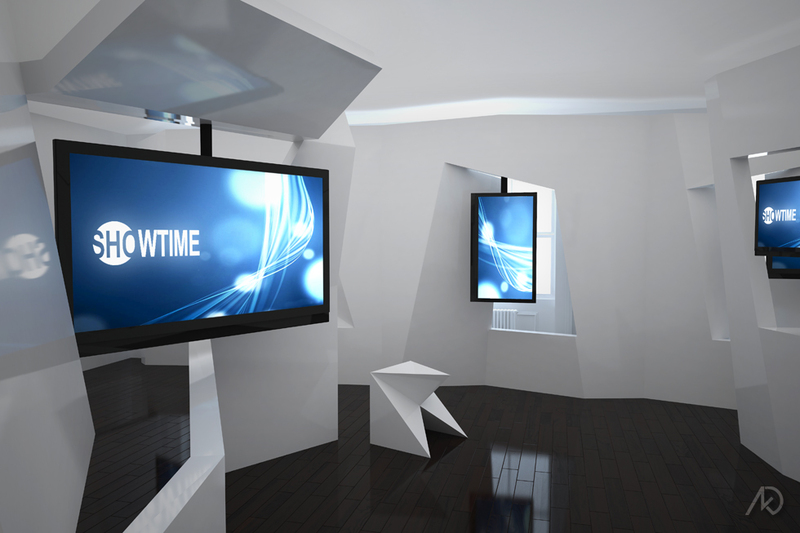 Luca Andrisani of Luca Andrisani Design + Interiors was commissioned to design one of the rooms (The Media Room – 400 sq. ft.) for the Metropolitan Home/Showtime Design House. Andrisani responded to the challenge by created a complex design of three folded wall panels. 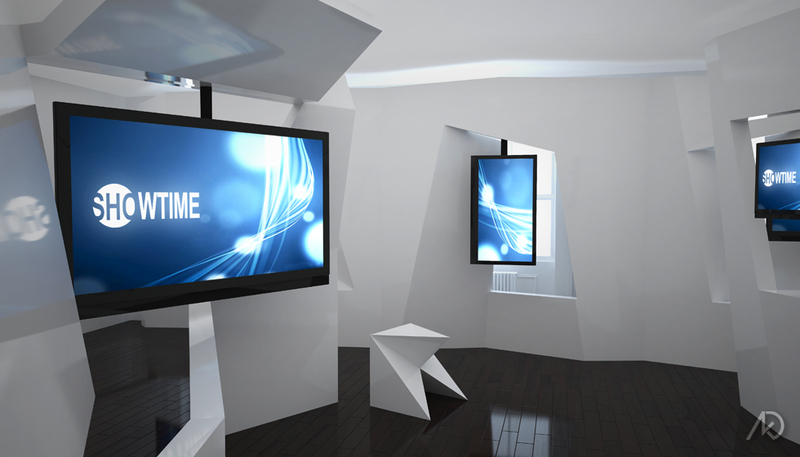 The folded panels created niches which allowed room to house large plasma screens containing media content. Conceptually, each wall is a single plane which has been cut and folded at multiple angles. If the wall panels were to be straightened out, they would form one flat, opaque wall plane. In regards to the 3d model, accuracy was very important. My work would eventually be used by the contractor to obtain accurate measurements for fabrication/construction purposes. All items in the scene were modeled, textured, and lit by kk. The entry view shows the complex wall forms and their relationship to each other. Th 3d model was a difficult design development exercise. Supplied only with sketches, site (room) photos/measurements, and a physical scale model made from bent cardboard, I began to translate the design into the digital three-dimensional form you see here. My work would eventually be used to obtain accurate measurements for fabrication/construction purposes, so accuracy was important. Initially, Andrisani’s design called for each wall facet to be outlined with fluorescent lighting fixtures; much like a Dan Flavin art installation. This made the 3d extremely tedious. Not only did each edge of the wall facets have to be resolved; they had to fit standard sized fluorescent fixtures. The interior view shows a bit more the depth and scale of the walls. Creating the wall in 3d became a bit of a process. First, each wall needed to be created digitally in 3d space as defined by Andrisani’s physical scale model. Each wall was given the needed wall thickness and proper mitered edge, resulting in some complex geometry. The axon diagram shows the geometry of all three faceted walls and their relationship to each other. Once the base geometry was established in 3d, each facet was adjusted in size depending on the light fixture layout. 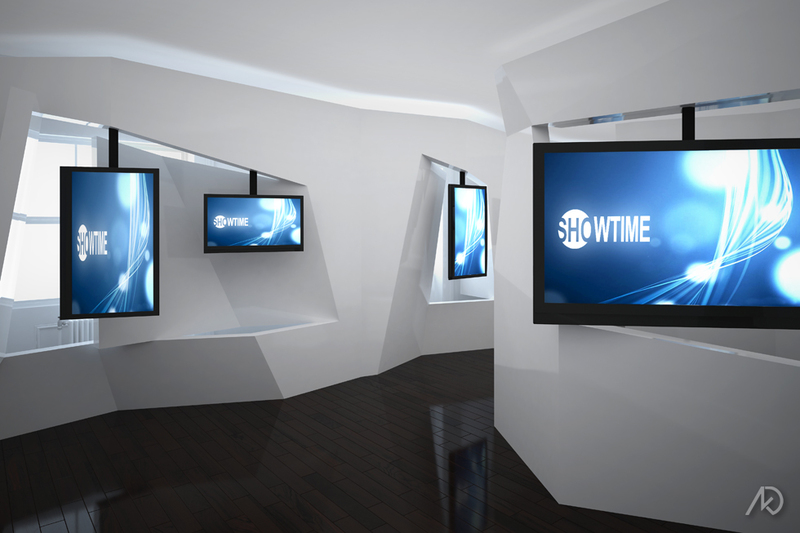 The fixtures were laid-out as efficiently as possible, creating a continuous light strip on the perimeter of the facet. Fixture size dictated the length of wall facet edges which in turn generated the angles of each facet in relation to the next which was also was dictated by fixture size/layout. After all that work, the florescent fixtures were later eliminated from the final design – a wise choice.